Unlocking the City was the theme for the inaugural Frequency Festival of Digital Culture in 2011. The festival marked the beginning of an exciting journey for Lincoln, its artists, academics and local residents to come together in celebrating the pioneering spirit of contemporary digital culture; and take its place as an active contributor on the international circuit of digital culture and arts festivals with a biennial event. Lincoln is a place that celebrates its historic past whilst embracing its digital future. Frequency 2011 transformed Lincoln into an interactive sensory playground with work by over 100 local, national and international artists, welcoming 30,000 visitors across 23 installations, 11 fringe exhibitions and 24 sites. A key festival highlight was the world-first of Metro-Boulot-Dodo’s interactive dreamland Four Seasons, being shown in the same city simultaneously. This included the premiere of SUMMER in the ambitious, interactive, four-part multimedia installation that reflects the different stages of life. 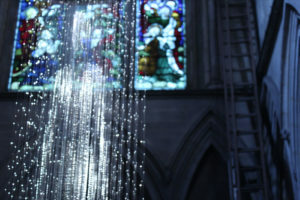 Other highlights include the artificial intelligence of Cypriot-Australian performance artist Stelarc’s prosthetic head, light sculptor Roseline de Thelin‘s haunting Light Beings, the kinetic sculpture of Alex Posada, multidisciplinary British artist Luke Jerram’s glass microbiology, and new media artist Andy McKeown’s lo-fi interactive street projections. FOUR SEASONS was a hugely ambitious series of cross-disciplinary work that spanned 5 years of MBD’s life. Each piece looked to the seasons to reflect different stages of life. Whether in galleries or outdoor spaces, these installations fused theatrical storytelling with state of the art automation to produce a series of living, breathing and constantly changing experiences. Occasionally a side character, sometimes the focus, FOUR SEASONS followed Polly’s journey from 8 to 80 years old, charting innocence, love, loss, regret and acceptance along the way. Roseline is internationally recognised for the unique work she developed with light as a medium and particularly fibre optic. Roseline’s series of “Homos Luminous” (latin for man of light), mysterious and ethereal holographic beings made of constellations of light points, question the existence of subtle parallel realities and the future of human kind. This work has been exhibited in London, Paris, Hong Kong, San Diego, Kuala Lumpur. 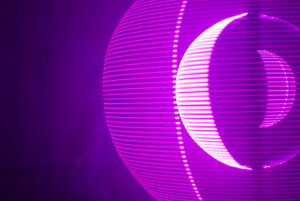 The Particle by Alex posada is a kinetic sculpture that experiments with colour, sound and movement. The continuous rotation, speed and light create visual POV effects that define the spatial structure of the object. The translucent skin created from the moving light becomes visible, creating shape and volume, both inside and outside the object. The sculpture forms and reacts by generating events that modulate the sound and space, constantly changing atmosphere and perception. The vibration of sound, colour and visual patterns evolve into chaos or order according to evolutionary algorithms that govern it. 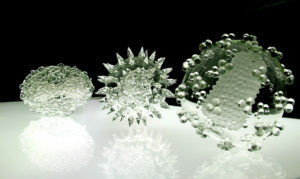 Glass Microbiology is a body of glass work which has been developed by artist Luke Jerram. Made to contemplate the global impact of each disease, the artworks are created as alternative representations of viruses to the artificially coloured imagery received through the media. In fact, viruses have no colour as they are smaller than the wavelength of light. By extracting the colour from the imagery and creating jewel-like beautiful sculptures in glass, a complex tension has arisen between the artworks’ beauty and what they represent. The Glass Microbiology sculptures are in museum collections around the world, including the Metropolitan Museum, NYC; Wellcome Collection, London and the Museum of Glass, Shanghai. They are also regularly displayed in exhibitions around the globe and sold to private collectors. Famous pop stars, celebrities and scientists own the works. 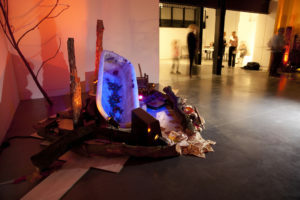 Frequency 2011 was a partnership between University of Lincoln, The Collection, The Usher Gallery and Lincoln Drill Hall, with Threshold Studios in the role of Festival Directors. Funding was secured from Arts Council England, Igniting Ambition (funded by Legacy Trust UK and the European Regional Development Fund) and Lincolnshire County Council’s Community Grant Aid scheme. Frequency 2011 was part of the Igniting Ambition Festival 2011, a Cultural Olympiad programme in the East Midlands which invested in projects and people that take the London 2012 Games as their inspiration to create once-in-a-lifetime cultural opportunities for audiences and communities.